Copyright © 2008 by the authors. All rights reserved. Last revised 2015-10-17. Abstract: The present report describes the construction of a technologically innovative electronic edition of the Old Church Slavonic “Life of St. Paul the Simple” from the Codex Suprasliensis. St. Paul the Simple lived in the early fourth century AD, and was a contemporary of St. Anthony the Great, a founder of Egyptian monasticism. The story of his life is found in Palladius of Helenopolis’s Lausiac History, an account of the lives of Egyptian hermits. The oldest extant Slavic copy is found in the Old Church Slavonic (OCS) Codex Suprasliensis, an undated (ca. eleventh-century) menaeum for the month of March. Several properties of the “Life of St. Paul the Simple” (very early Slavic text, non-biblical text, extant Greek original, text not otherwise represented in the OCS canon) make it an important object of study for Slavists, and also provide an opportunity to explore the possibilities afforded by modern electronic text technology to produce an edition that would support research and teaching as effectively as possible. In addition to its immediate utility for research and pedagogy, we envision this rather small-scale project (the text occupies 157 lines in the manuscript) as an opportunity for technological innovation that can then be applied to the development of similar editions of larger texts in the future. In spring 2008 the authors of this article prepared exhaustive linguistic annotations for each of the approximately 800 words in the text of the “Life of St. Paul the Simple” as part of a training exercise in an introductory graduate course on Old Church Slavonic.1 As we completed these annotations, which had been intended initially merely as a pedagogical training activity, we recognized that they could serve as the basis for a technologically innovative electronic edition, for which we established the goals of identifying and satisfying as many research and teaching needs and applications for this text as possible. In particular, we wanted to ensure that scholars and students would be able to read the text in OCS, Greek, and English both separately and in parallel; to identify the linguistic properties of every word in the text; to conduct searches according to those linguistic properties; to conduct string searches; and to examine facsimile reproductions of the manuscript pages alongside character-based transcriptions. OCS. The upper left frame presents the OCS text, divided into verses according to Lucot 1912 and numbered 1–4 and 9–13 (the folios that originally contained verses 5–8 are missing from the manuscript). In addition to numbering the verses, we have added word divisions (the manuscript is written in scriptio continua, as was standard for Slavic writing of the time), marked line ends with vertical bars (“|”), and inserted folio labels (86r through 88v). 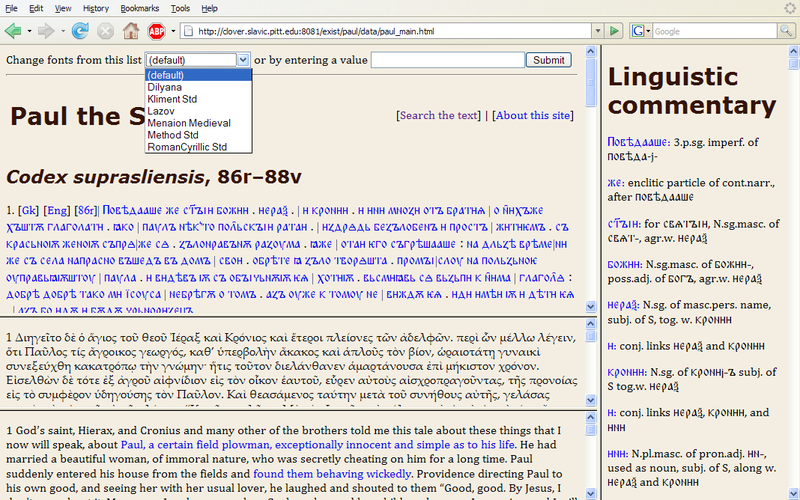 We have also introduced into the text four different types of links to other pages, as follows: Clicking on the labels “Gk” and “Eng,” at the beginning of a verse causes the Greek and English windows, respectively, to scroll to the same verse as the OCS, thus enabling the user to read the OCS with the Greek and English in the background for comparative purposes. Furthermore, each word in the OCS is a clickable link that causes the right Linguistic Commentary window to scroll to the annotation for that word. Finally, clicking on the folio labels opens a new Page View. These other views are all described below. Greek. 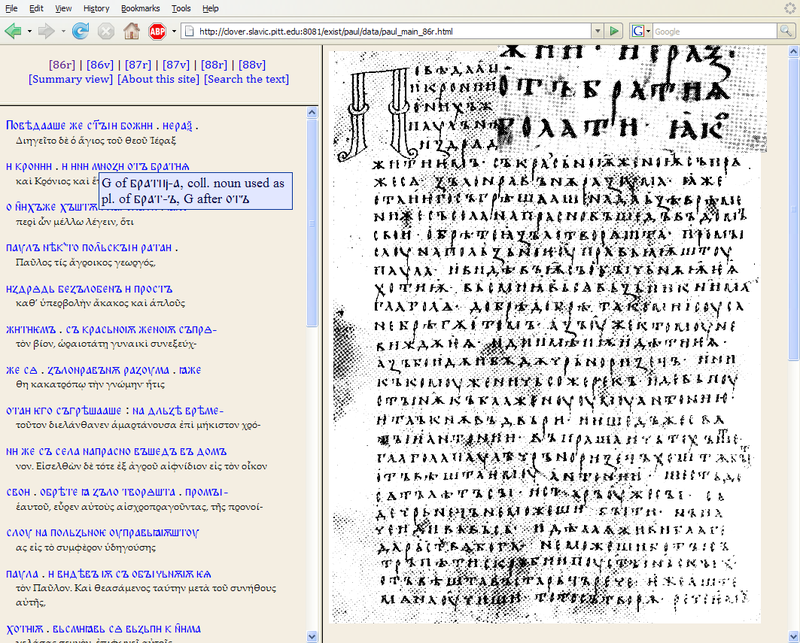 The Greek (middle left frame) is transcribed from the text published in Supr 1982. Other Greek versions of the “Life of St. Paul the Simple” are better known (e.g., Migne) and more accessible, but the one we selected is the closest to the OCS, and therefore most appropriate for our purposes. English. The English translations (lower left frame) are ours, and are based directly on the OCS. Other English translations are available (e.g., TourEgypt), but they are based on other branches of the textual tradition, and do not correspond very closely to the OCS. The English text also contains links to illustrations of portions of the text that were prepared by one of the authors specifically for this edition. Linguistic commentary. The linguistic commentary (right frame) was prepared by the authors for this edition. It identifies the part of speech and all relevant grammatical categories for every word in the OCS, and, where appropriate, it also provides syntactic commentary about the function of the word in its context. The linguistic properties of some words are ambiguous, and competing analysis are presented and discussed in this section of the edition. The head words in the Linguistic Commentary window are linked back to the OCS; when the user clicks on any such head word, the main OCS window scrolls so that the word in question is at the top of the frame and is highlighted. To prevent the otherwise inexorable accumulation of highlighted words over time, which would come to defeat the purpose of singling out the word that is of most immediate interest to the user, the highlighting disappears on the next such search or whenever the user clicks on a word in the OCS frame itself. In addition to the principal text in these four windows, the OCS window contains three additional features. One is a link to an About this site page, which describes the genesis and implementation of the project, identifies the authors, and provides a brief description of the “Life of St. Paul the Simple” along with a list of abbreviations used in the linguistic commentary. Another is a link to a Search interface, described below. Finally, there is a font-switcher at the top of the window, which lets the user select on the fly the font that will be used to render the OCS text. In 2004 one of the authors of this paper developed a simpler version of the Main view interface as part of a project for publishing annotated editions of Russian fairy tales, which we called “The Annotated Afanas′ev Library” (“AA”) (see Figure 2). The main window in “AA” is divided into three frames. The left frame contains the main text in which there are two types of clickable links: words and phrases and superscript numbers. 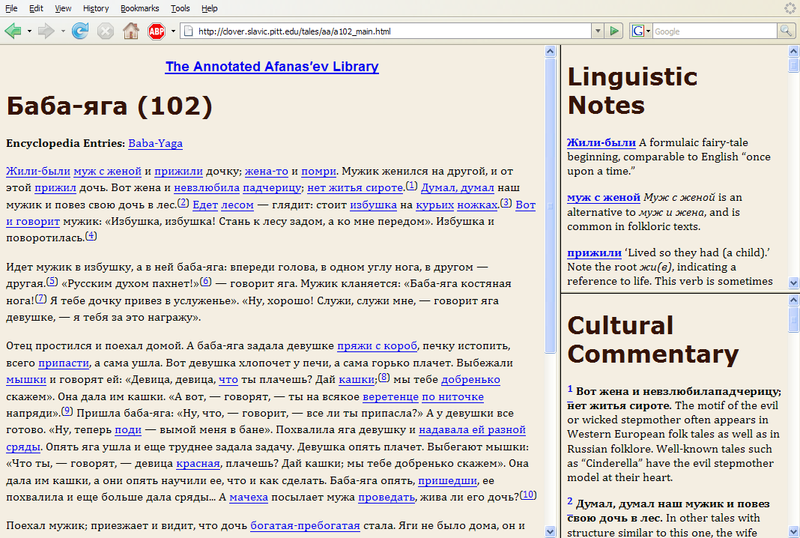 The clickable words and phrases are those that might pose linguistic problems for the undergraduate Russian language students who constitute the target audience for this site, and clicking on a word or phrase causes the upper right (Linguistic notes) window to scroll to the appropriate annotation. As with the “Life of St. Paul the Simple” site, the annotations are back-linked, so that clicking on a head word in the Linguistic notes frame causes the main Text frame to scroll, positioning that word at the top of the frame. The superscript numbers identify text that might require cultural or folkloric commentary, and clicking on those links causes the lower right (Cultural commentary) window to scroll. The Cultural commentary entries are also back-linked to the Main text. Finally, there are links at the top of the Main text frame to a small Encyclopedia of Russian folklore and fairy tales, where we record information that might apply to multiple tales (as a way of avoiding repeating the same text in the annotations to each tale). When we decided to prepare an electronic edition of the “Life of St. Paul the Simple,” we began by considering how the “AA” interface might be adapted for this new project. In “AA” we needed two distinct levels of textual commentary (linguistic and cultural/folkloric), while the “Life of St. Paul the Simple” required just linguistic annotations, a simplification that allowed us to collapse the two right-side frames of “AA” into one in the “Life of St. Paul the Simple.” On the other hand, for the latter project we needed to find ways to enable the user to see the Greek and English text together with the OCS, for which purpose we divided the left side of the window into three frames and created links from the OCS to the Greek and English at the verse level. In an effort to avoid further clutter in the OCS frame, which was already very heavily marked up with links to the Linguistic commentary frame, we put links to the illustrations into the English frame, and we also included the identification of biblical citations and allusions only in the English frame (note the reference to Daniel and link associated with the text “standing on a rock” in the English frame in Figure 3). Figure 3. Example of biblical reference and link to illustration in the English frame. Navigation. The Navigation window (upper left frame) provides easy access to the six pages of the manuscript that contain the “Life of St. Paul the Simple,” as well as to the Main (summary) view, the About this site page, and the two Search interfaces (linguistic and full text). Interlinear OCS and Greek. 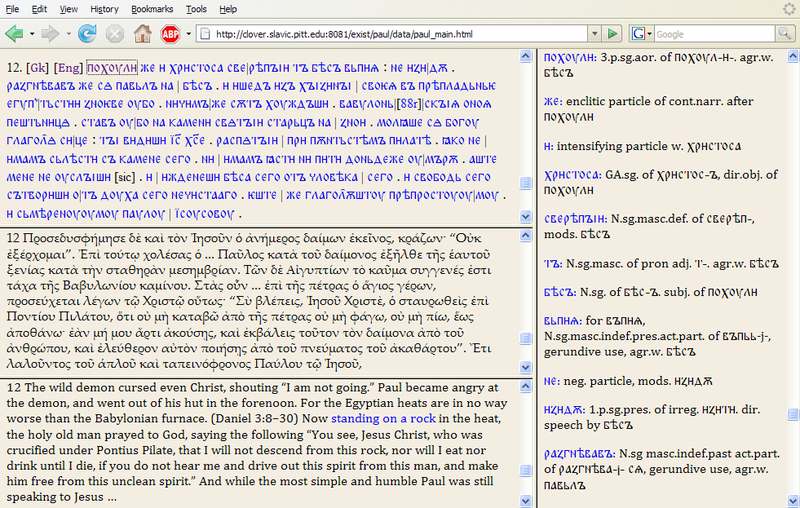 The Interlinear window (lower left frame) transcribes each manuscript page line by line and displays the corresponding Greek text immediately below each line, which supports easy comparison of the two versions. Mousing over any word in the OCS text causes the linguistic commentary for that word to be rendered as a “tool tip,” floating above the text. 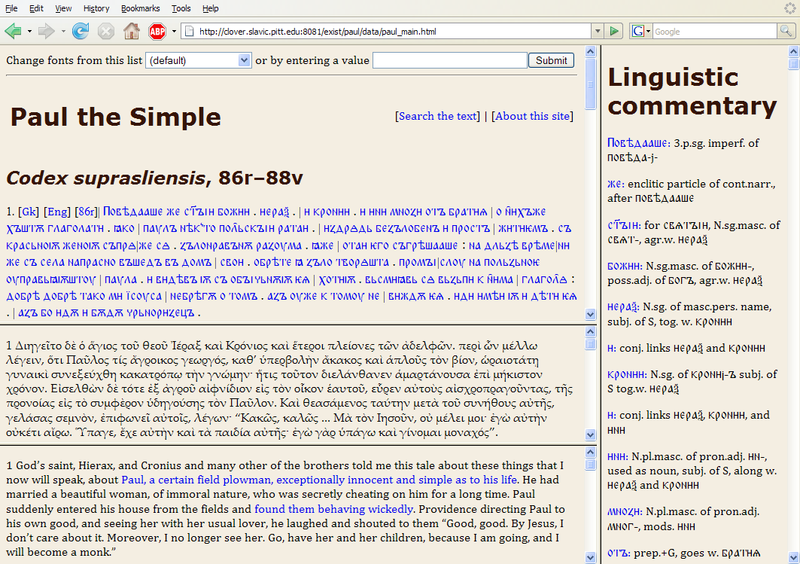 The linguistic annotation is exactly the same as that displayed in the Linguistic commentary frame of the Main view; here it is implemented as a floating tool tip because there is not sufficient room on the screen to support an additional separate Linguistic commentary frame. In Figure 2, the user has moused over the word братиѧ at the end of the second line on the page, causing its annotation to emerge. Facsimile. The Facsimile window (right frame) displays a photographic facsimile of the manuscript page whose transcription appears to the left. The frame includes a “magnifying glass” that enlarges an area of text; the user moves the locaton of the magnifying glass “window” by moving the mouse. In Figure 2, the mouse has been moved over the word братиѧ at the end of the second line, causing it and a bit of surrounding text to be enlarged. Figure 5. A page of the Hypatian copy of the Rus′ Primary Chronicle. Figure 6. 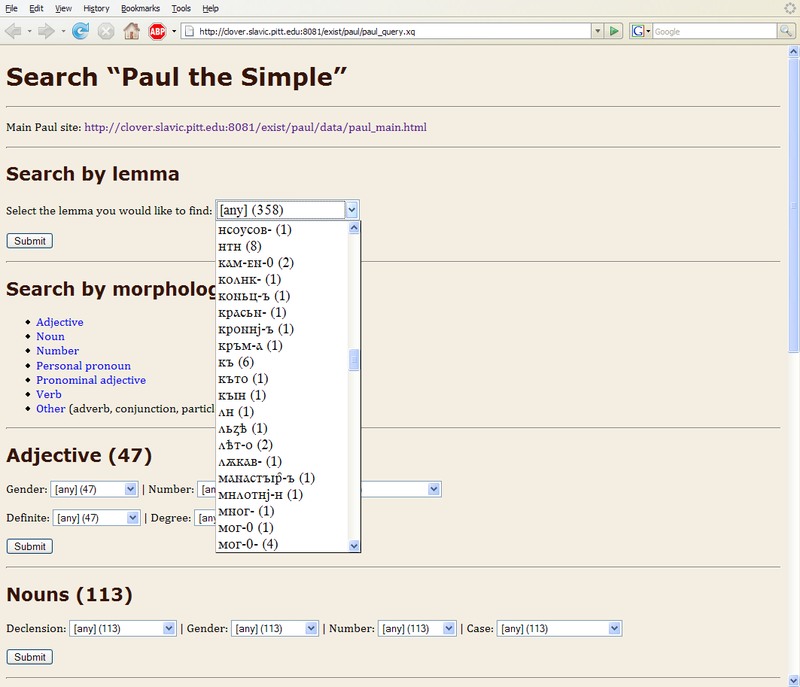 Linguistic search interface view. Lemma. Every word in the text is associated with a base form, or lemma, and the system permits searches for all forms of each lemma. Part of speech. The system allows users to search within a particular part of speech by grammatical category. The parts of speech are Adjective, Adverb, Conjunction, Noun, Number, Particle, Personal pronoun,2 Preposition, Pronominal adjective,3 and Verb. Each part of speech supports searching according to appropriate grammatical categories, so that, for example, nouns can be searched according to declension type, gender, case, and number. As noted above, verbs are classified according to the categories appropriate for the form, so that, for example, the present tense has person but not case, while participles have case but not person. Users may retrieve a list of all word forms for a particular part of speech or may filter that list according to any combination of grammatical categories. Figure 7. Output of search for neuter nouns. 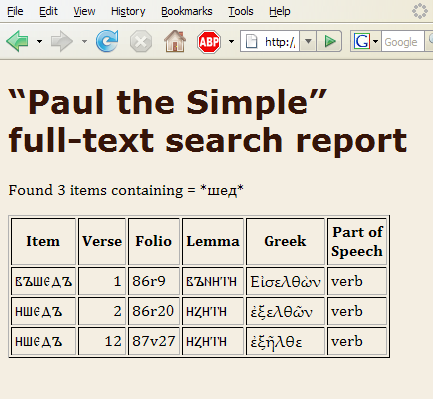 A linguistic search interface is the feature most often requested by users of the “e-PVL,” and the much smaller scale of the “Life of St. Paul the Simple” allowed it to serve as a manageable test-bed for this type of functionality. The most innovative feature of the query form is that it is constructed on the fly each time the user navigates to the URL, which lets it calculate dynamically the number of items in each category (note the numbers in parentheses in various places in Figure 6). This means that the form adjusts itself automatically to changes in the markup (such as annotating a two-word phrase either as one item or two). While most of the categories are predetermined (e.g., the category of gender always has masculine, neuter, and feminine as possible values, even when the count in one of these categories for a particular part of speech may be zero), the list of lemmata is compiled on the fly, so the form adjusts itself automatically as we modify the identification of lemmata in the corpus. Figure 8. 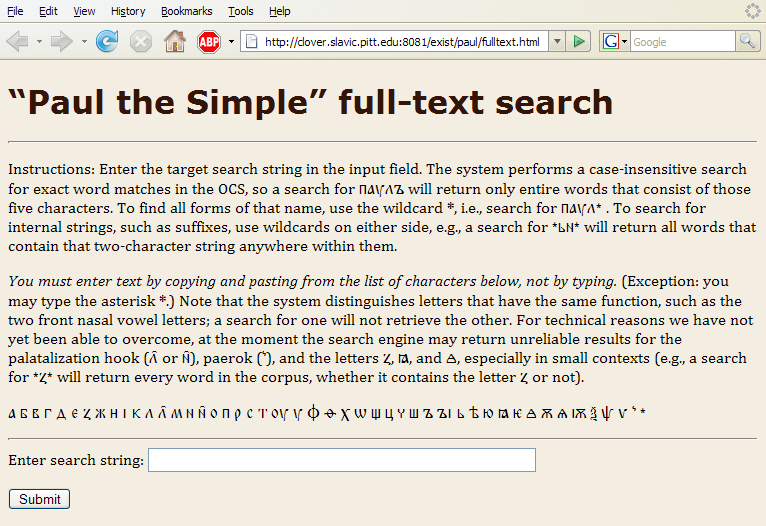 Full text search interface. 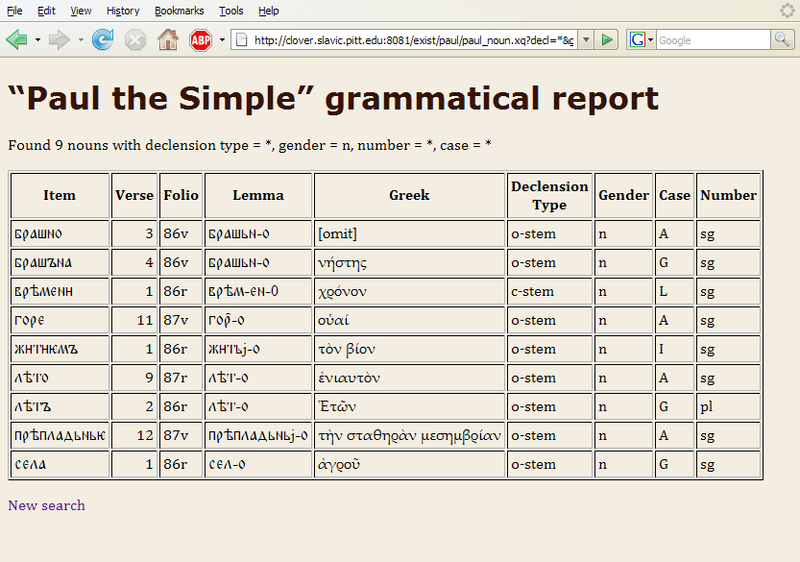 The Full text search inteface (Figure 8) allows the user to search for a string of characters anywhere in a word, and return a list of matching items together with lemma, Greek counterpart, and all available grammatical information (see the sample output in Figure 9). Figure 9. Output of full text search for *шед*. The full text search engine looks for entire words that match the search string exactly, which makes it easy to find entire words. For example, that a search for въ would return only full words that consist of the two letters (i.e., the prepositionвъ), but not any occurrence of those two letters when they do not consitute a word. The system also supports the asterisk (*) wildcard, which stands for a sequence of zero or more non-space and non-punctuation characters, so that a search for *въ* would retrieve all words that contain a sequence of those two characters anywhere within them (whether as the entire word or as part of the word). This feature is particularly useful when searching for morphemes (e.g., the adjectival suffix ьн, although a search for *ьн* will also retrieve the noun дьнь and other false positives) or lexemes irrespective of ending (e.g., паул* will retrieve all case forms of the name, although this type of retrieval is also possible through a lemma search). Full text searching is easily available in the Main view because web browsers provide a string search “find” feature, but the Full text search interface returns a convenient list of matches along with all relevant grammatical information, arranged in tabular form. Furthermore, the “find” feature of web browsers does not support wildcard searches, and although it searches for substrings automatically (and therefore does not require leading or trailing wildcards), it has no support for the equivalent of internal wildcards (e.g., a search for all verbs that begin with the prefix съ– and end with the reflexive particle сꙙ. The “Life of St. Paul the Simple” project is implemented in eXtensible Markup Language (XML), and uses related structured text and Internet technologies. XML (http://www.w3.org/XML/) is a Worldwide Web Consortium (W3C) standard for encoding structured text. It is similar to Hypertext Markup Language (HTML, http://www.w3.org/html/), the language used to deliver web pages, except that it allows the user to identify (“tag”) text according to its meaning or function, and not merely its appearance. Thus, each word in the “Life of St. Paul the Simple” carries with it annotations about its lemma, its linguistic properties, its Greek counterpart, etc. One of the most valuable aspects of XML for a project of this sort is that because the document is annotated according to the meaning and function of its parts, rather than according to their appearance, it is possible to generate multiple views from the same source document. 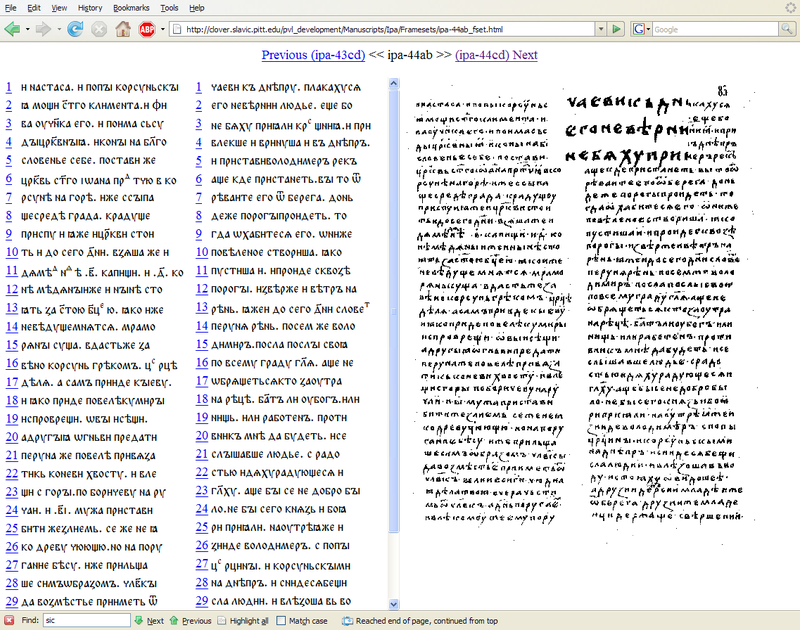 For example, the OCS in the Main view is combined in a single web page, it is broken into verses that are laid out like paragraphs, it incorporates vertical lines to mark the ends of lines in the source manuscript, it identifies page numbers in the manuscript, and it includes links to the corresponding Greek and English versions. The OCS in the Page view, on the other hand, is divided into lines according to its layout in the manuscript, there are no vertical bars to mark line ends, and there are no page references (except that each manuscript page is a separate web page). In the Main view, mousing over a word in the OCS does nothing, but clicking on it scrolls the Linguistic commentary frame. In the Page view, clicking on a word in the OCS does nothing, but mousing over it causes a tooltip to materialize and hover. These two very different views of the data are generated programmatically from a single XML source file, which means that it is impossible for the data to get out of sync (e.g., the linguistic commentary in the Linguistic commentary frame of the main view will always be exactly the same as the linguistic commentary in the tooltips), and any modification to the project needs to be made only once and in only one place, whereupon it will automatically migrate to all relevant views. Furthermore, because the linguistic annotations and other links are embedded alongside the words to which they apply in the XML source file, all links across frames are maintained automatically. Adding or removing an annotation does not require renumbering, and it is impossible for any generated link to point to the wrong target (or to a non-existent one). The source XML is converted to HTML (in multiple forms) for delivery on the Internet with the help of eXtensible Stylesheet Language Transformations (XSLT, http://www.w3.org/TR/xslt), which is a specialized programming language that is designed to transform XML into other forms. Since HTML can be conceptualized as an implementation of XML, XSLT is very well suited for XML-to-HTML transformations. XSLT works together with XML Path Language (XPath, http://www.w3.org/TR/xpath), which provides a mechanism for XSLT to identify and transforms specific portions of an XML document according to instructions that the user specifies using XSLT. The Linguistic and Full text search interfaces are based on XML Query Language (XQuery, http://www.w3.org/XML/Query/), which also uses XPath as its addressing mechanism, and which enables users to operate with XML similarly to the way one might interact with a relational database. XQuery is thus ideally suited for searching XML documents quickly and generating structured reports (in HTML in the case of the “Life of St. Paul the Simple” project). Although the “Life of St. Paul the Simple” is a fairly small project in terms of the amount of source data, the need to develop multiple views of the same data and to keep them in sync would have made it impossible to develop and maintain traditional web pages by authoring them manually without serious risk of introducing errors and inconsistencies in coding. The technologies described above insure the consistency and structural integrity of the data in ways that would not otherwise be available. Dilyana. Free. Designed by Ralph Cleminson. Available at http://www.obshtezhitie.net/res/dilyan.ttf. Black-letter glyphs. Also includes Glagolitic. Kliment Std. Free. Designed by Sebastian Kempgen. Available at http://kodeks.uni-bamberg.de/aksl/Schrift/KlimentStd.htm. Modern glyphs based on Times Roman, but with early letter forms. Lazov. Free. Originally designed by Rumjan Lazov and now maintained by David J. Birnbaum. Available at http://www.obshtezhitie.net/res/lazov_5.1.ttf. Black-letter glyphs in a modern interpretation. Menaion Medieval. Free. Originally designed by Viktor Baranov and adapted for Unicode 5.1 by David J. Birnbaum. Available at http://www.obshtezhitie.net/res/Menaion_djb_5.1.ttf. Glyphs based on an eleventh-century Rus′ manuscript hand. Method Std. Free. Designed by Sebastian Kempgen. Available at http://kodeks.uni-bamberg.de/AKSL/Schrift/MethodStd.htm. Black-letter glyphs. RomanCyrillic Std. Free. Designed by Sebastian Kempgen. Available at http://kodeks.uni-bamberg.de/AKSL/Schrift/RomanCyrillicStd.htm. Modern glyphs based on Times Roman. It tries the following fonts in the order listed for OCS in the Main and Page views: Lazov, Menaion Medieval, Method Std, Kliment Std, and RomanCyrillic Std, and Dilyana, using the first one it finds installed on the user’s system. If it finds none of them installed, the browser falls back on whatever fonts it finds (which probably will not render Unicode 5.1 characters correctly). The order is partially dictated by an aesthetic preference for larger glyph sizes and more archaic letterforms. Users can override this order and select a specific font with the Font switcher, about which see below. It uses the same fonts in a different order for the list of lemmata on the Linguistic search page: Kliment Std 51, RomanCyrillic Std, Menaion Medieval, Lazov, Method Std, and Dilyana. The order here is partially dictated by a preference for more modern typefaces, which are somewhat easier to read in the drop-down list of lemmata. For rendering Greek it tries the following fonts in the order listed, and then falls back on whatever it finds in the system: Palatino Linotype, Kliment Std 51, RomanCyrillic Std, Arial Unicode MS, Times New Roman, and Times. Kliment Std 51 and RomanCyrillic Std were designed by Sebastian Kempgen (see above), Times is a core Mac OSX font distributed with the operating system, and the other three are core Microsoft Windows fonts distributed with Microsoft Windows XP and Vista. The “Life of St. Paul the Simple” is the first medieval Slavic text published on the Internet in Unicode 5.1. While developers could work around certain lacunae in the early Cyrillic support in Unicode 5.0 (e.g., using the codes for modern з or я to represent early ꙁ and ꙗ, respectively), the use of ꙙ and ѧ to represent the non-jotated and jotated front nasal vowel, respectively, posed an insurmountable problem, since Unicode 5.0 lacked any adequate way of representing the ꙙ characater. Thus, Unicode 5.1 makes it possible for the first time to represent texts from the Codex Suprasliensis in a standards-conformant way. This means that users will be able to use any Unicode 5.1 conformant font to render the OCS in this edition, and the text can be migrated to other platforms and applications without concern about non-standard encoding. The Font switcher was developed originally for the “e-PVL”, and then modified to support the Unicode 5.1 encoding used in the “Life of St. Paul the Simple.” Because users often have preferences concerning the appearance of their documents, the Font switcher enables the developer and the user to cooperate to render the document accurately, but in a way that addresses the latter’s aesthetic preferences. The Codex Suprasliensis, a Cyrillic parchment manuscript datable to the eleventh century, is the largest extant Old Church Slavonic codex (285 folios). It contains most of a menaeum (devotional and edificatory readings arranged by the church calendar) for the month of March and selected other texts of a religious character. The manuscript was discovered in the early nineteenth century in a monastery library in Supraśl, Poland. Later in the century it was divided into three parts; currently there are 151 folios in the Polish National Library in Warsaw (Zamoyski Library Collection BOZ 201), 118 in the Library of Ljubljana University (Cod. Kop. 2), and 16 in the Russian National Library in St. Petersburg (Bychkov Collection Q. perg.I.72). The Lazov and Menaion Medieval fonts available on the web site are maintained with High-Logic’s shareware FontCreator (http://www.high-logic.com/fontcreator.html). The XML-related files used in the project were authored and edited using SyncRO Soft’s <oXygen/> (http://www.oxygenxml.com/). The search engine is managed with the open-source eXist XML database (http://exist.sourceforge.net/). XML files are converted to HTML for delivery with Saxonica’s open-source Saxon-B XSLT processor (http://saxon.sourceforge.net/). Facsimile photographs of the manuscript pages were scanned from Supr 1982 using a Microtek ScanMaker V6usl scanner with Microtek ScanWizard 5 software (http://www.microtekusa.com/) and edited with Adobe Photoshop CS3 (http://www.adobe.com/products/photoshop/index.html). The site was tested with the most recent versions of Mozilla Firefox (Microsoft Windows and Mac OSX, http://www.mozilla.com), Internet Explorer (Microsoft Windows, http://www.microsoft.com/windows/products/winfamily/ie/default.mspx), Opera (Microsoft Windows, http://www.opera.com/), and Safari (Microsoft Windows and Mac OSX, http://www.apple.com/safari/). The magnifying glass code was released as freeware by Vincent Mes and is available at http://webdeveloper.earthweb.com/webjs/jsimage/item.php/660841. Walter Zorn’s code supporting font selection within tooltips is available at http://www.walterzorn.com/tooltip/tooltip_e.htm. The authors are grateful to Sebastian Kempgen, Wendell Piez, and Mark Weixel for comments and suggestions. 1 Each word was identified by part of speech and all applicable grammatical categories. For example, nouns were identified according to gender, declension type, case, and number. Verbs were identified according to the categories relevant for the tense or mood (for example, case was required for participles but not for present tense forms, person was required for present tense forms but not for participles, etc.). 2 For morphological reasons we group къто, чьто, and their negative and indefinite compounds together under the rubric of Personal pronoun. 3 For morphological reasons we group possessive, demonstrative, quantitative, and relative pronouns together under the rubric of Pronominal adjectives. 4 The Unicode 5.1 characters in the preceding sentence will be garbled if you do not have a Unicode 5.1 compatible font installed on your system. Should that happen, please download and install one of the fonts listed in the following paragraph and try again. 5 Because these are regular TrueType fonts, their utility is not restricted to viewing web sites, and they can used in any application that allows users to select fonts (e.g. word processors, etc.). 6 This “font sniffing” relies on the browser’s standardized behavior, which means that it may give erroneous information in some browsers on some operating systems if they deviate from the applicable standards. The Annotated Afanas′ev Library. Designed and edited by David J. Birnbaum and David Galloway. http://aal.obdurodon.org. The e-PVL. Texts prepared by Donald Ostrowski, editor; David J. Birnbaum, associate editor; Horace G. Lunt, senior consultant. Electronic edition designed and implemented by David J. Birnbaum. http://pvl.obdurodon.org. Palladius. Histoire Lausiaque (vies d’ascètes et de pères du désert). Texte grec, introd. et traduction française par A. Lucot. Paris, A. Picard. 1912. Супрасльская рукопись. Труд Сергея Северьянова. Graz : Akademische Druck-u. Verlagsanstalt. 1956. Originally published as v.2 of Памятники старославянского языка. 1904. Супрасълски или Ретков сборник. В два тома. Йордан Заимов увод и коментар на старобългарския текст. Марио Капалдо подбор и коментар на гръцкия текст. София: Изд-во на Българската академия на науките. 1982–83. Corpus Cyrillo-Methodianum Helsingiense. Codex Suprasliensis. http://www.slav.helsinki.fi/ccmh/suprasliensis.html. Lausiac History (Historia Lausiaca) by Palladius. Part 5. http://touregypt.net/documents/lausiac5.htm#Chapter%20XXVIII.